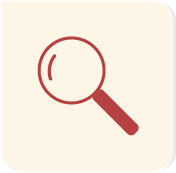 Visit the SEO Manager by selecting it in the app menu or by visiting the Dashboard and selecting it there. Click RUN SEO REPORT to update the information on this page and generate your overall site score. If you don’t run a report for 30 days, a new one will be generated automatically. PAGE INFORMATION lets you know how many of your pages are missing meta titles and meta descriptions. Click “Pages missing meta titles/descriptions” to reveal which pages need to be addressed. 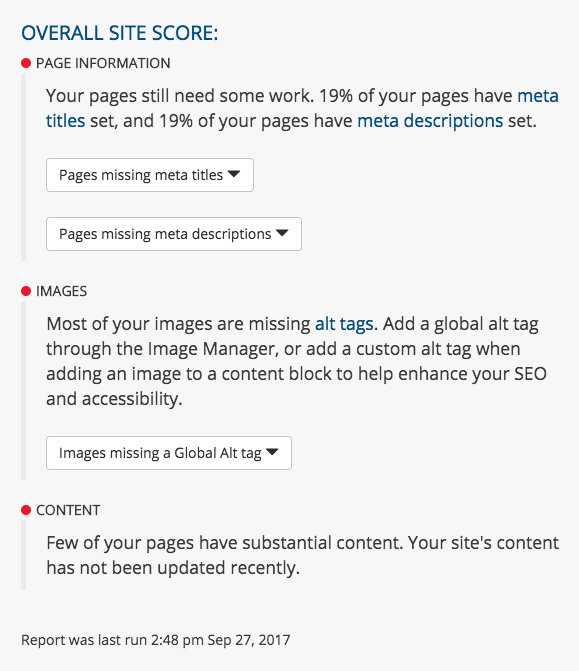 IMAGES tells you which images on your website are missing alt tags. Click "Pages missing a Global Alt tag" to reveal which images need to be addressed. 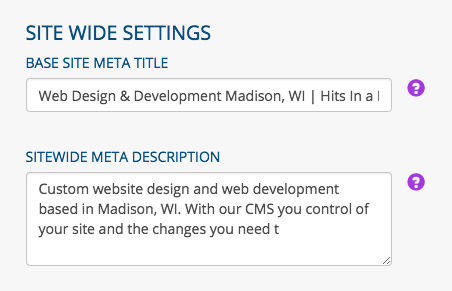 The BASE SITE META TITLE will be appended to any page that does not have a custom meta title. Those pages will be titled: ‘Page Title | Base Site Meta Title’. Leave this field empty to remove the site title from every page. What is a meta title? The SITEWIDE META DESCRIPTION will be used for those pages that don’t have a meta description. Leave this field blank to avoid default meta descriptions on your site. What is a meta description? 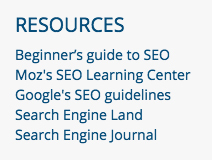 Check out some valuable RESOURCES that will help you improve your site’s SEO performance, whether you are an SEO beginner or an expert. The SEO Manager also generates reports on a page-by-page basis. To view a report, go to the Page Manager home page and click the “Edit” button that corresponds with the page you would like to view. Scroll to the bottom of the page to see the report (below). Items with a red circle indicate they need immediate attention. Yellow denotes a lesser priority, and green items are good to go. A new report is generated every time you visit a page in the /admin area of your website.